Trichoscopy, Dermoscopy, Scalp, Inflammatory Inflammatory scalp diseases – cite! Inflammatory scalp diseases (message) Inflammatory scalp diseases – participate! Tinea capitisThis glossary term has not yet been described. The most characteristic trichoscopic findings of tinea capitisThis glossary term has not yet been described. include comma hairs, corkscrew hairs, zigzag hairs and Morse code hairs (1-3) (4, 5) (6-8). Moreover black dots and broken hairs are frequently detected (9). 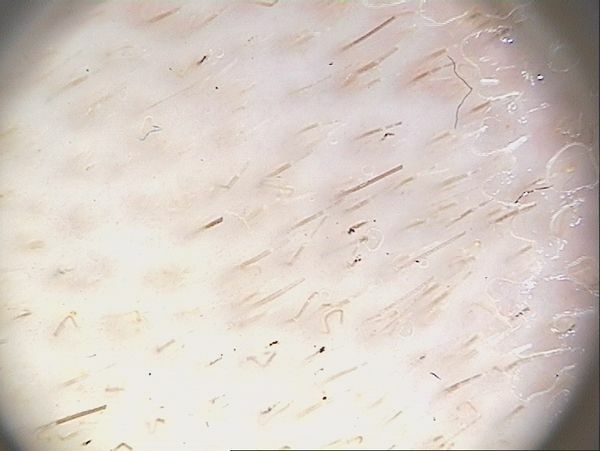 Other trichoscopic features include bent hairs, i-hairs, block hairs and perifollicular/interfollicular scaling (10, 11). 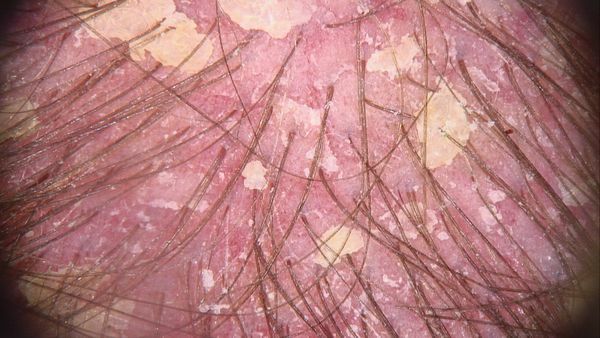 The successful treatment of tinea capitis is characterized by reduction of short broken hairs, corkscrew hairs and zigzag hairs and latter comma hairs and black dots (10). Template:Trichoscopy of tinea capitis with presence of comma hairs, corkscrew hairs and Morse code hairs. PsoriasisThis glossary term has not yet been described. ScalpThis glossary term has not yet been described. psoriasisThis glossary term has not yet been described. is characterized by presence of red dots and globules (in high magnification observed as glomerular vesselsThis glossary term has not yet been described.) in circular or linear arrangementThis glossary term has not yet been described., white interfollicular scaling and erythematous background (12, 13). Moreover, blood extravasations may be observed (12). Template:Trichoscopy of scalp psoriasis with presence of red dots in circular arrangement and erythematous background. Template:White, interfollicular scaling in patient with scalp psoriasis. Seborrheic Dermatitisalso known as eczema is a group of diseases that results in inflammation of the skin. In seborrheic dermatitisThis glossary term has not yet been described. thin arborizing vesselsanalytic term is branched vessels; Bright red sharply in focus large or thick diameter vessels dividing into smaller vessels; BCC, atypical vessel and yellowish interfollicular scaling are mainly observed (13). Template:Yellow, interfollicular scaling in patient with seborrheic dermatitis. 1. Slowinska M, Rudnicka L, Schwartz RA, et al. Comma hairs: a dermatoscopic marker for tinea capitis: a rapid diagnostic method. J Am Acad Dermatol. 2008;59(5 Suppl):S77-79. 2. Mapelli ET, Gualandri L, Cerri A, et al. Comma hairs in tinea capitis: a useful dermatoscopic sign for diagnosisis the identification of the nature and cause of a certain phenomenon. Diagnosis is used in many different disciplines with variations in the use of logic, analytics, and experience to determine "cause and effect". In systems engineering and computer science, it is typically used to determine the causes of symptoms, mitigations, and solutions of tinea capitis. Pediatr Dermatol. 2012;29(2):223-224. 3. Hernandez-Bel P, Malvehy J, Crocker A, et al. 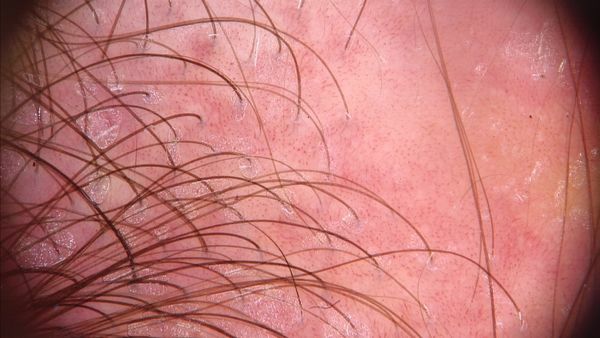 Comma hairs: a new dermoscopic marker for tinea capitis. Actas Dermosifiliogr. 2012;103(9):836-837. 4. Hughes R, Chiaverini C, Bahadoran P, et al. Corkscrew hair: a new dermoscopic sign for diagnosis of tinea capitis in black children. Arch Dermatol. 2011;147(3):355-356. 5. Vazquez-Lopez F, Palacios-Garcia L, Argenziano G. Dermoscopic corkscrew hairs dissolve after successful therapy of Trichophyton violaceum tinea capitis: a case report. Australas J Dermatol. 2012;53(2):118-119. 6. Rudnicka L, Rakowska A, Kerzeja M, et al. Hair shafts in trichoscopyThis glossary term has not yet been described. : cluesEvidence, in an investigation for diagnosis of hair and scalp diseases. Dermatol Clin. 2013;31(4):695-708, x. 7. Lacarrubba F, Verzi AE, Micali G. Newly described features resulting from high-magnification dermoscopy of tinea capitis. JAMA Dermatol. 2015;151(3):308-310. 8. Elghblawi E. Idiosyncratic Findings in TrichoscopyThis glossary term has not yet been described. of Tinea Capitis: Comma, Zigzag Hairs, Corkscrew, and Morse Code-like HairThis glossary term has not yet been described.. Int J Trichology. 2016;8(4):180-183. 9. Lanuti E, Miteva M, Romanelli P, et al. Trichoscopy and histopathologyThis glossary term has not yet been described. of follicular keratotic plugs in scalp discoid lupus erythematosusis a chronic skin condition of sores with inflammation and scarring favouring the face, ears, and scalp and at times on other body areas. These lesions develop as a red, inflamed patch with a scaling and crusty appearance. The centre areas may appear lighter in colour with a rim darker than the normal skin.. Int J Trichology. 2012;4(1):36-38. 10. Campos S, Brasileiro A, Galhardas C, et al. Follow-up of tinea capitis with trichoscopy: a prospective clinical study. J Eur Acad Dermatol Venereol. 2017;31(11):e478-e480. 11. Rakowska A, Slowinska M, Olszewska M, et al. New trichoscopy findings in trichotillomaniaThis glossary term has not yet been described. : flame hairs, V-sign, hook hairs, hair powder, tulip hairs. Acta Derm Venereol. 2014;94(3):303-306. 12. 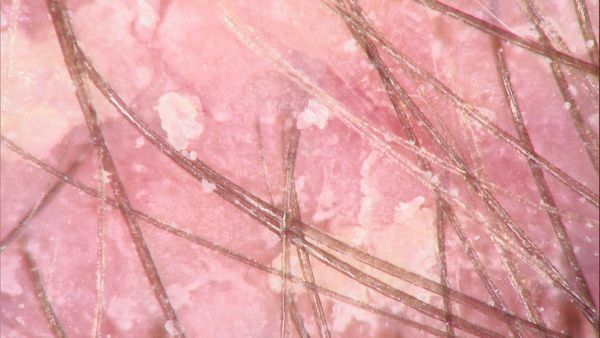 Rudnicka L, Olszewska M, Rakowska A. Atlas of trichoscopy: dermoscopy in hair and scalp disease. London: Springer; 2012. 13. Rudnicka L, Olszewska M, Rakowska A, et al. Trichoscopy update 2011. J Dermatol Case Rep. 2011;5(4):82-88. This page was last modified on 29 March 2019, at 14:29.